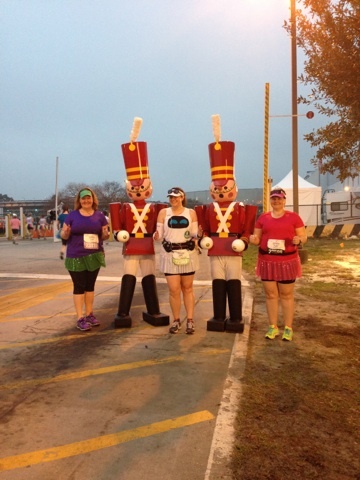 These recaps may be out of order but we’re starting with the 10K! 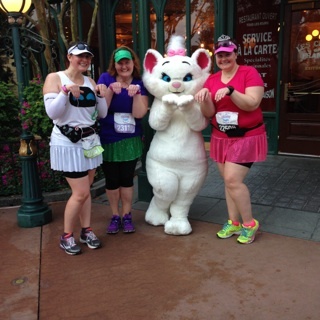 The morning was a typical runDisney morning – early morning wakeup and bus ride over to Epcot. Walking over to the start line, I heard my absolutely favorite line of the entire weekend. The announcer was interviewing two ladies, one from Seattle and one from Missouri. My ears perked up as I’m from Seattle, now living in Missouri. The line was “Seattle, the natural enemy of Missouri”. Ha! That still brings a big smile to my face. 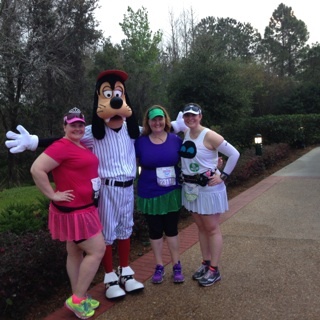 One of the best parts about runDisney, is the friends I’ve made through it. Speaking of friends, I found Abby, Jamie, Pam and a few others. Abby & Pam were planning on doing 1:15 / 1 run / walk so I decided to join. Our corral was sent off with some pretty pathetic fireworks. Seriously, pathetic compared to the corrals before us. 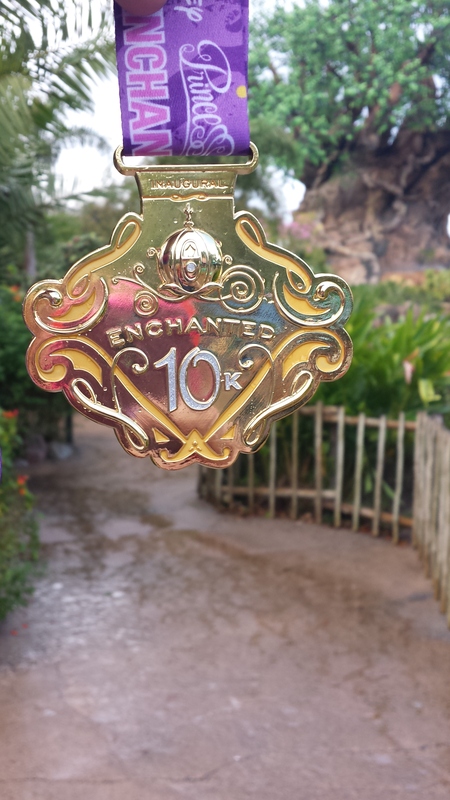 I set my expectations low for the 10K after hearing the many disappointing Minnie 10K stories. We took the first mile easy, letting the crowds die down. The first few miles were backroads and fairly boring. The first character was the White Rabbit which we passed up. Not much further up the road was Pocohantas and Meeko, which we did stop for. As we got closer to Epcot, we saw the Christmas Toy Soldiers!! Score!! Of course we were stopping! We made our way into Epcot, just past Norway (if memory serves). We ran from character to character (Jiminy Cricket, Louis from Princess and the Frog, Marie from the Aristocrats) through the World Showcase until we exited just past France and headed towards the Boardwalk. I was most excited about running on the Boardwalk and it did not disappoint. It was dawn, just starting to get light. It was beautiful with the lights still lit and the day breaking (sadly no pics). Baseball Goofy was out so we stopped. Back towards Epcot and one last character stop with Donald before heading towards the finish line. I saw the finish line and took off! Done! I love the 10K medal!! I left Pam & Abby after we received our medals to head towards the busses. And then I saw Ariel. 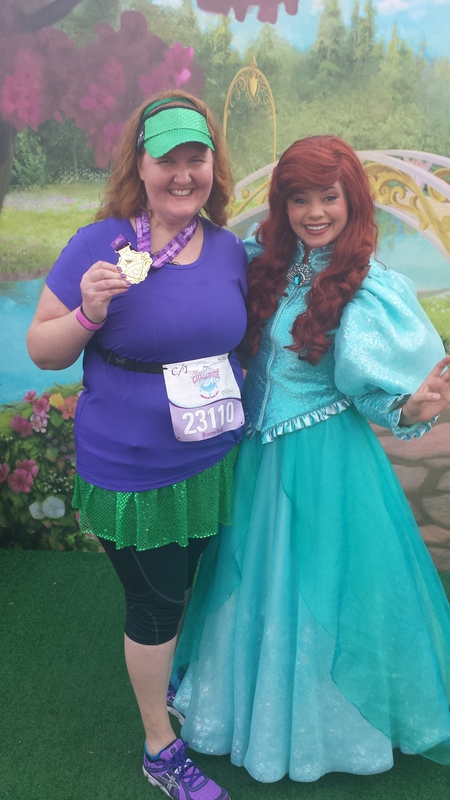 Since I was dressed as Ariel, I definitely needed a picture with her! I got in line and started willing the people in front of me to go faster! The skies were getting cloudy and I felt a rain drop. The thought running through my mind was please let me get my picture before it rains! I got to the front of the line and the handler told me that was it. Boo. But then Ariel spoke up to say she’d take her picture with the mermaid and then she’d go back in. Hallelujah!! Totally made my day. I made it back to the hotel and met up with Jana & crew where we spent the day at Animal Kingdom. 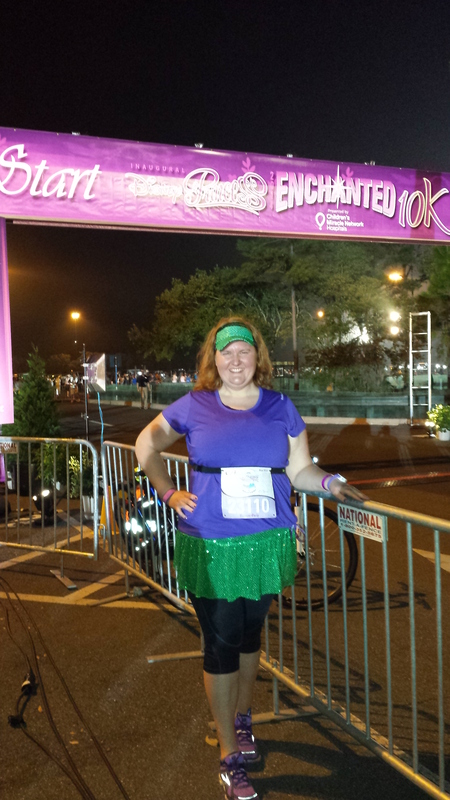 This entry was posted in Race Report, runDisney and tagged Enchanted 10K, Glass Slipper Challenge. Bookmark the permalink. That was so nice of Ariel to get one last picture with you. The whole time we were in line the handler kept saying that the characters would have to go in if it started to rain, but luckily we made it through! That is a really cool pic of your medal! I know!! I was so happy she made the exception for me. Glad you got your picture as well. Us Ariels need to stick together! It’s great that she took a picture with you. And love all the character photos! I completely missed the White Rabbit and thought Meeko was the first stop. Can’t wait to read about the half! Thanks!! I’m so behind on recapping things…I just realized I never finished recapping my trip to Barcelona last November! Seriously!! I think it does need a frame! 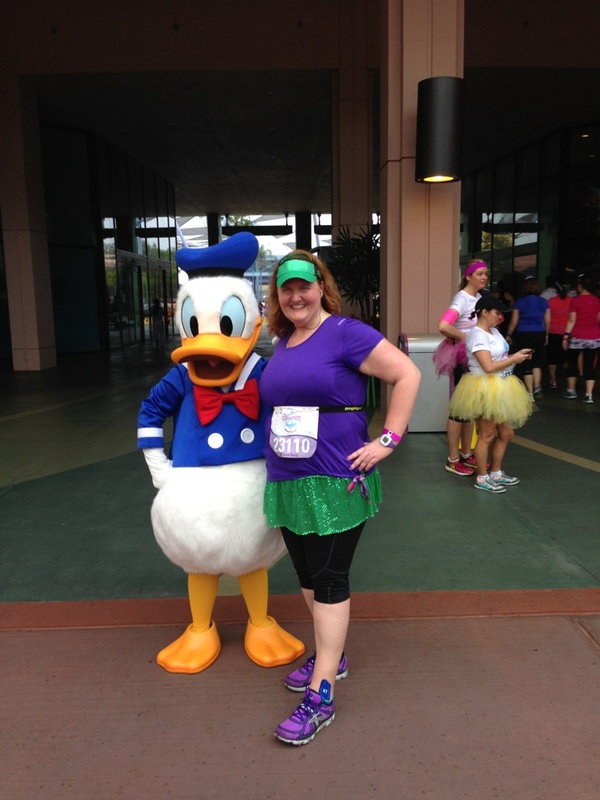 I know – running together totally made the race! I love the you soldier picture and I’m glad you got your Ariel pic! It was good to see you! It was so good to see you too!! Best part about these weekends!